UK Poker News brings you the concluding part of our interview with sports journalist and poker player, Jeff “JaffaCake” Kimber, a finalist at the Ladbrokes Poker Cruise and WPT Bay 101 Main Events. In parts 1 and 2, Jeff explained his poker background, qualifying for the Ladbrokes Poker Cruise and WPT tournaments and the excitement of playing a top poker cruise event. In this part 3, Jeff talks in detail about the star-studded WPT event at San Jose in which he eventually finished so high on the leader board. Look out for an amusing interlude with UK Poker News’ own contributor, John Gale! UKPN: What was your experience of the WPT event itself? What were the highlights of getting through a field full of such high quality players? JK: As it was a bounty event, with $5,000 paid for each ‘name’ you took out, I knew I would be with one star straight away, as there was one on every table. I recognised Kenna James when he sat down, Stetson and all, and he was very polite, introducing himself and liking the fact he had an Englishman two to his left raising his blinds. When Isabelle Mercier sat down on my table too I thought this could be tough, and then TJ Cloutier turned round and said to the guy who sat one to my right, who I still don’t know, ‘How come you aren’t a bounty in this, you should be man’ I thought I’d have my work cut out! However, I ground out a couple of levels and got up to around 14,000 from the starting 10,000, and then reraised a small stack to try and isolate him with my AK suited. It was passed round to Isabelle, who raised again. I thought for a good three minutes before deciding it was too early to get into a big pot with just ace high and folded. When she turned over aces to take out the short stack, I was very pleased with my play and grew in confidence. Kenna asked what I had and I thought it would do me no harm to tell the truth, to which he said ‘good pass’. A couple of rounds later I raise Kenna’s blind with AK and he reraises me…..now I think he may either have me down as a rock, or as someone intimidated by the named players, so I reraise him. He goes all in, which had me slightly worried, but I couldn’t pass given what I’d put in, and he said ‘I hope you have a pair of jacks’. His AQ didn’t improve (despite the flop of 9 10 J!) and I’d taken my first bounty, had $5,000, a signed t-shirt, pose for the cameras with Kenna and game on with a chip lead on my table. I used the chips well and was going very nicely when our table broke. Along with another guy off my table, I was moved to a table two to the right of John Gale. Now I’d only met John once or twice through other friends, but when a WPT winner greets you with a handshake and a ‘Jeff, mate, I didn’t realise you were playing this, how are you?’, it goes down very well, and gains you instant respect from the table who now fear they may be facing two players as good as John, who is a big star in the USA. I also noticed the guy from my first table, who obviously had me down as some online qualifier, now realising that perhaps this wasn’t my first ever game, as me and John sat and chatted. As the day progressed players dropped pretty quickly, John among them against a bad player re-reraising his QQ with A10 and hitting a str8 after a Q high flop (I gained revenge for John later the next day, remembering this bad play and getting that guy to reraise my flopped trips with his mighty A5). I took out American pro David Plastik, connecting with two pairs with my suited connectors against his overpair, and the table broke. 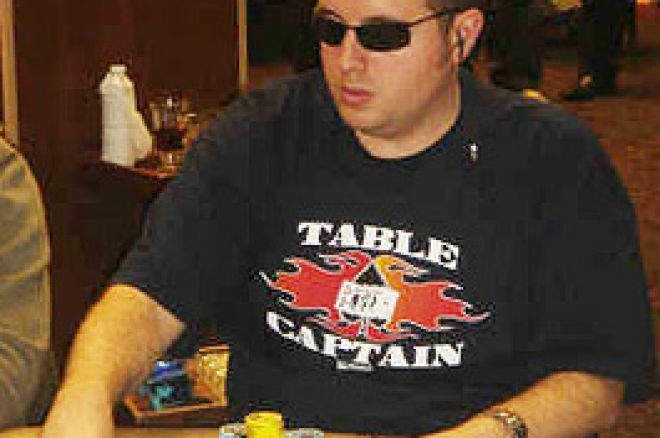 I then moved to my favourite table, which had Layne Flack two to my left, Patrik Antonius to my right and also featured Steve Zlotow and Marcus Traniello. Layne was fantastic to play with, very friendly, very entertaining and keen to have fun as well as win. Just before one break I reraised him with 88 as he was raising nearly every hand, but he put me all in. I couldn’t call, but I stared him down before passing. At the break I went for a breath of fresh air, and Layne Flack came and tracked me down to talk over the hand! It was unreal. He told me he thought I had a big ace, I told him I thought he had a middle pair but maybe bigger than mine. He told me he had QQ and was regretting playing it so quick when I told him I had 88! He knew I was making a stand over the constant raising, and while it cost me a few chips, I think it made him think twice about pushing me around….there were easier targets for him. Sitting in between Patrik and Layne was no fun in terms of chip gathering, but I had enough to take no risks and re-evaluate on day two. I found David Williams a fantastic player later in the tournament, we had quite a few run ins and he always seemed to make the right decision. Rob Mizrachi, younger brother of Mike, who is one of my favourite players to watch, seemed to have the skills of his sibling, but one highlight had to be sitting with Chip Reese for a few hours, especially having recently read the book ‘The Man Behind the Shades’, which is the life story of Stu Ungar in which Chip features pretty heavily. Again a gentleman to play with but a fine, fine player, I felt like getting a note book out to write down what I was learning playing with these guys to use myself later! On day three I knocked out Dan Harrington, which I was very proud of. I’d asked him to sign his book, Harrington on Hold ‘Em, for me after breakfast that day, and even though I hadn’t played with him, he knew I was the English kid still in. I think he’s a great player, and was very proud of not only taking him out, but taking him out playing poker, not finding a bigger hand than his and throwing it all in preflop. I’d sat beside him and had raised preflop, bet out when I missed the flop and folded to a reraise. Soon afterwards I hit the flop and check-raised a guy. I know that Dan watches all these things so I was determined to mix it up if I got in a hand with him. On my next big blind he limped under the gun and I checked my KQ. The flop came KJ2, giving me top pair, which I check. Dan bets the pot, I think and call. The turn 9 gives us both str8 draw, I check, Dan bets half of his stack, I put him all in and the river is a blank. UKPN: Did you feel you could have made it to the final table and a WPT TV appearance or was 9th place as good as you could have expected? JK: I was very proud to get as far as ninth, but when you’re in there and so close to the TV table, it’s hard to not think what might have been. I was standing around 5th of nine when a local lad raised my blind. I look down at 88, a good hand when we’re playing five handed, and I reraise him, as I think he’s weak. He goes all-in but with no confidence, and I’m sure he’s playing ace something. I’m now faced with calling off two-thirds of my stack (in total) on a coin flip, but I’m sure I’m ahead and I’m getting two to one, so I call. I’m right, he turns over A9 off and looks sick. And then the dealer spoiled it all by putting down a flop with two aces on it! A few hands later I still had a playable stack and raise four times the big blind with JJ. The same guy flat calls from the button. The flop comes 7 high with two hearts so I go all in first to act and he calls in a flash with Q6 hearts. Not a play I’d have made pre or post flop given the odds, but he felt lucky and he was, a queen on the turn and a heart on the river. I know if things had gone my way on those hands I’d have had a chance at the $1million-plus first prize, but that’s poker I guess. I asked Conor Tate, a friend of mine who was the top British finisher at last year’s WSOP, whether he ever thinks that may have been his big chance and he’ll never get as close, as I sometimes think about my first WPT experience, but he is a very sensible fella as well as a hell of a poker player, and he reckons we have the distinct advantage over most of our peers of knowing what it takes to get that far, what to expect when you get there and how to play next time! UKPN: Are you planning to go to the WSOP this year? If so, what events are you planning to play? JK: I qualified with Ladbrokes at the first time of asking, and their package is great, taking in a $1,500 warm up event, the main event, and a consolation $1,500 event if you don’t make the second week in the Big One. So I’m hoping to play just the two! I would like to play more but I’m still working at the moment and can’t go for the month or so I’d like. Next year maybe…. UKPN: Finally, Jeff, what else are you up to now in poker and what goals do you have looking forward? JK: At the moment my goals are to keep this year going as it has been. I was within one card of winning a $25,000 seat the WPT Bellagio tournament, my AK losing to AJ on a J river, again on the WPT site. I really want to get back to the States and play some more WPT events; the structure, organisation and settings are excellent and allow for poker to be played at all times. Obviously I’m playing my first World Series next month, my first ambition there is to make day two, then to make the money, then who knows. I think I have the game to go deep in any tournament, but it’s all about continually proving it. If I can do that the sponsorship offers should come in which would be a fantastic way to make a living, but for now it’s a case of not running before I can walk. I can of course afford to give up work now and play full time but I feel like I still have a lot to learn and I’m striving to be a better player every time I sit down at a table. I’ve definitely improved a lot this year and if the improvement continues then who knows. UKPN: Jeff, thanks again for talking to UK Poker News. We wish you every success in poker. JK: Thank you very much and congratulations on a great site. Ed note: The WSOP starts soon. Download Pacific Poker for some great chances to qualify.